Who is this mystery man, and what put him in the path of our Resistance heroes? Join Ben Acker & Ben Blacker (Star Wars Join the Resistance, Star Wars: The Last Jedi – The Storms of Crait) and Kev Walker (Star Wars: Doctor Aphra, Darkhawk) as they reveal a day in DJ’s life just before his appearance in the film! Unlike the Doctor Aphra or even the Darth Vader comic book series, Star Wars: The Last Jedi – DJ – Most Wanted #1 suffers from an unfortunate Star Wars problem. First off, the official title of the book is a definitive example of the problem. The title has to over explain what’s inside and books like these suffer from having to fit into a slim narrative that is not only dull but ultimately unnecessary. 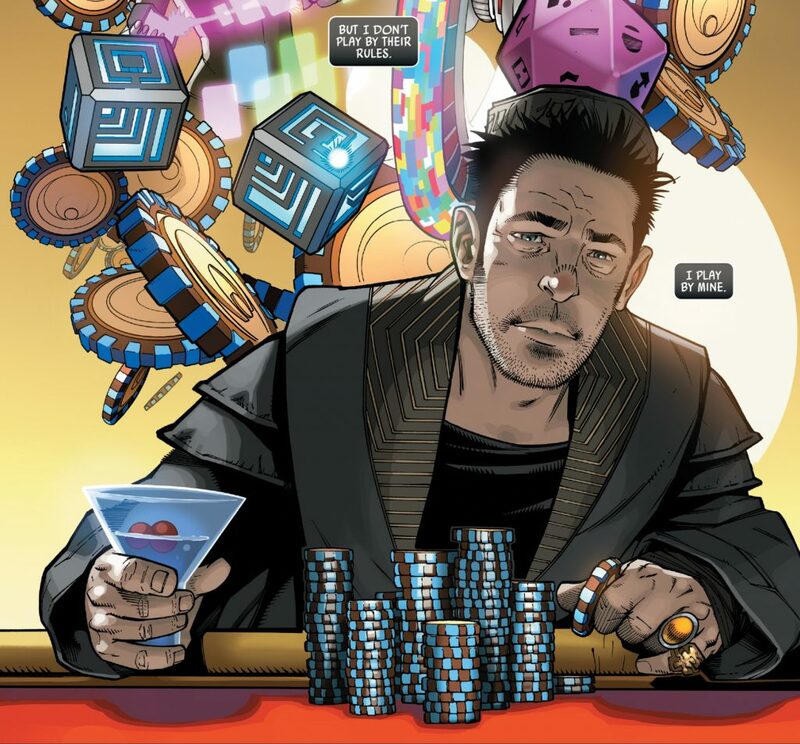 I don’t put all the blame on writers Ben Blacker and Ben Acker as I’m sure their hands are being tied trying to wedge this story to be the direct predecessor to DJ’s first appearance in The Last Jedi. The story feels like it’s being shoehorned into place rather than expanding on a character we know little about even with what we see in the movie. This story is set on Canto Bight and while Blacker and Acker do their best to set-up a gangster casino mystery it ultimately falls flat with trying or possibly having to serve the set-up to The Last Jedi. Based on what we saw in the movie we understand that DJ serves only his needs but this is a perfect opportunity to show Star Wars fans why rather than just how he wound up in jail prior to meeting Finn and Rose. 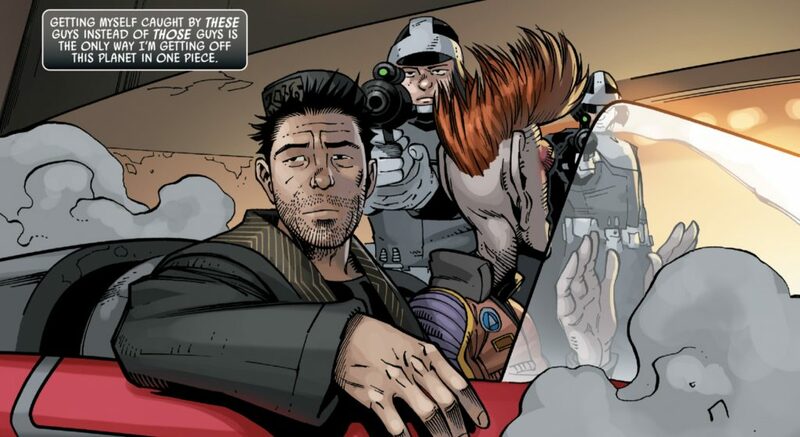 Books like Vader and Aphra and even the mini-series for Captain Phasma give us more insist and layered characterization than something like DJ – Most Wanted which simply sets-up his appearance in The Last Jedi. Sadly it ultimately makes this story virtually unnecessary and serves no real purpose in expanding fans understanding of new and possibly more interesting characters. Don’t get me wrong, I really enjoyed Benicio Del Toro’s role as DJ in the movie but this book does little to make me like, care or understand him more than what the movie offered. The one bright spot of this book is the art by Kev Walker. His ability to illustrate DJ so that’s it looks like the character in the movie without the photorealism that the standalone Star Wars title relies so heavily on upon. Also, Walker does a great job with the fun, color, and action that should serve a more interesting and layered story but Walker’s visuals give the book the boost it so desperately needs. 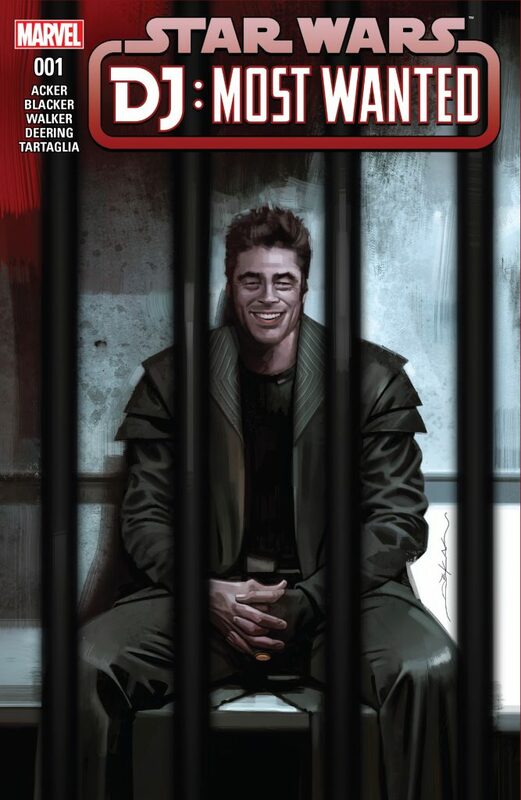 I wish I liked this book more since I do like the character but it just didn’t expand enough on what could have been a much more interesting and well-rounded look at a character we don’t know nearly enough about but could have if it wasn’t forced to fit into such a narrow existing narrative. It should have been a story able to stand on its own.